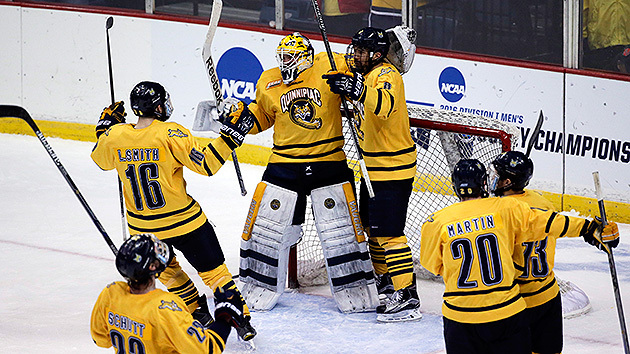 Quinnipiac and Denver each booked tickets to the 2016 Frozen Four with quarterfinal wins on Sunday. All four tickets are punched. North Dakota, Quinnipiac, Denver and Boston College will gather in Tampa on April 7 for this year’s Frozen Four. The final two tickets were punched Sunday night, with Quinnipiac and Denver earning trips. The nation’s best is heading to Tampa. No. 1 overall seed Quinnipiac is off to the Frozen Four with a win over UMass Lowell. The victory featured a three-goal second period in which in the Bobcats scored all three goals in a matter of eight minutes. It is the school’s second trip to the Frozen Four. Its last was in 2013, when it lost to Yale in the national championship game, 4–0. After the RiverHawks started the game with a 1–0 lead thanks to Dylan Zink, the Bobcats struck back, starting with Landon Smith’s shot from the point that found the back of the net. Junder two minutes later, Sam Anas scored on a slick backhand goal over Kevin Boyle’s shoulder. Scott Davidson then picked up the team’s third of the afternoon to close out the second period, and Travis St. Thomas added some insurance late in the third period as well. At the other end, Michael Garteig turned away 34 shots, a performance that followed his shutout over RIT in the opening round. Quinnipiac will now face Boston College, which beat Minnesota-Duluth on April 7. It will be the first meeting between the programs this year. For the first time in more than 10 years, the Pioneers are going to the Frozen Four. Denver’s six-goal day helped it get to Tampa, where it will take on North Dakota at 8:30 p.m. ET on April 7. All six goals came from different members of the Pioneer program. Ferris State and Denver traded goals in the first period before Trevor Moore gave Denver the lead with the lone goal in the second period. After a Bulldog goal seven minutes into the third period, Denver quickly struck back as Blake Hillman scored the go-ahead and Nolan Zajac added one just 25 seconds later. Quentin Shore then put the game out of reach with 2:27 remaining in the third. Denver leads the tournament with the most goals scored (13). Its Frozen Four opponent, North Dakota, has posted the second most with 11. North Dakota and Denver, members of the National Collegiate Hockey Conference​, have met five times this season. Each team won twice before they tied in their final meeting of the season. This is the Pioneers’ first trip to the Frozen Four since 2005, when they won their second title in a row. The Pioneers have not missed the tournament since 2007.